Lactose intolerance is one type of food sensitivity — it’s not an allergy. It is the result of not having enough lactase, an enzyme that digests the natural sugar in milk, lactose. Lactose intolerance is a very individual condition, which means people are able to tolerate different amounts of lactose. Most people can continue to enjoy the taste and health benefits of lowfat and fat-free dairy foods by drinking lactose-free milk, having small amounts of milk with meals or including natural cheeses or yogurt in their diet. 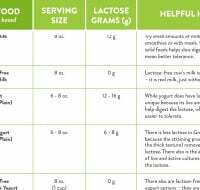 Try lactose-free milk and milk products. They are real milk products, just without the lactose, and provide the same great nutrients as regular dairy foods. Start with a small amount of milk daily and increase slowly over several days or weeks. Mix milk with other foods, such as smoothies, soups or sauces — or pair it with meals. This helps give your body more time to digest it. Shred your favorite natural cheese onto soups, pastas and salads. It’s an easy way to include dairy that is low in lactose. People who are lactose intolerant have a hard time digesting the sugar (called lactose) that is naturally found in milk and may experience discomfort after consuming dairy foods. Stomachaches, bloating or gassiness can have many different causes. Your doctor can help you find out if you are lactose intolerant or if your digestive discomfort is caused by something else. 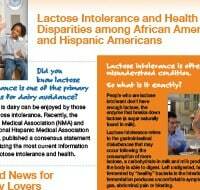 What’s the difference between lactose intolerance and a milk allergy? A milk allergy is caused by a reaction to the protein in milk. This is different from lactose intolerance, which occurs when your body has a hard time digesting the natural sugar (or carbohydrate) in milk. While people with milk allergies must avoid dairy, avoidance is not necessary for those who are lactose intolerant. Milk and milk products are an important source of key nutrients, such as calcium, phosphorus and vitamin D, for all people – including those who are lactose intolerant, or cannot easily digest lactose, the sugar found naturally in milk. Health and nutrition experts agree that it’s difficult to get enough of these nutrients without dairy in your diet. I’m Lactose Intolerant. Now What?